Further the investor/ claimants are requested to visit the web-link www.iepf.gov.in to claim their money which are already transferred by the company in the Investor Education and Protection Fund account. The company places uncompromising emphasis on integrity, ethical conduct and adherence to regulatory compliances. This code of conduct should ensure compliance with all legal requirements and with the company ‘s standards on business conduct. All Directors and members of Senior Management of the company must act within the authority conferred upon them and with a duty to take informed decisions in the best interests of the company and its shareholders/stakeholders. With a view to maintain the high standards of Corporate governance, the following code of conduct should be observed diligently. All Directors and members of the senior management must understand the importance of compliance and the consequences of non-compliance. The company has appointed the Company Secretary as a Compliance Officer for the purposes of this code. This code is subject to modification. The company will up-date this Code from time to time to ensure that it reflects changes in the law/regulatory environment and gives appropriate emphasis to current issues of concern. The company will notify such change to all the Directors and members of Senior Management. All Directors and members of Senior Management shall conduct their activities, on behalf of the company and on their personal behalf, with honesty, integrity and fairness. All the Directors and members of Senior Management will act in good faith, responsibly, with due care, competence and diligence, without allowing their independent judgment to be affected. The Directors and members of Senior Management will act in the best interests of the Company to fulfill their fiduciary obligations. a) The Directors and members of Senior Management should not engage in any activity/employment that interferes with the performance or responsibility to the company or otherwise in conflict with or prejudicial to the company. b) The Directors and members of Senior Management and their immediate families should not invest in a company, customer, supplier, developer or competitor and generally refrain from investments that compromise their responsibility to the Company. The Company feels that serving on the Board of Directors of other companies may raise substantial concerns about potential conflict of interest. And therefore, all Directors must disclose such relationships to the Board as and when they are appointed/cease to be on the Board of Directors of other companies and any changes therein. Any information concerning the company’s business, its customers, suppliers etc., which is not in the public domain and to which the Directors and members of Senior Management have access or possesses such information, must be held in confidence, unless the disclosure is required as a matter of law. No Director or member of Senior Management shall provide any information either formally or informally, to the press or any other publicity media, unless specially authorized. Any Director or member of Senior Management of the company shall not derive benefit or assist others to derive benefit by giving investment advice from the access to and possession of information about the company not in public domain. All Directors and members of Senior Management will comply with insider trading regulations issued by SEBI. No director or members of Senior Management of the Company shall receive or offer, directly or indirectly, any gifts, donations, remuneration, hospitality, illegal payments and comparable benefits which are intended (or perceived to be intended) to obtain business (or uncompetitive favours or decisions) for the conduct of business. Nominal gifts of commemorative nature, for special events may be accepted or offered. The Directors and members of Senior Management must protect the company’s assets including human resources and information and may not use these for personal use, unless approved by the Board. Any waiver of any rule of this Code by any Director or by any member of Senior Management must be approved in writing by the company’s Board and should be disclosed. The rules contained in this Code are of utmost importance to the company, its stakeholders and its business partners. Therefore, all Directors and members of the Senior Management should adhere to these rules. The company will take appropriate disciplinary action on deliberate failure to comply with these rules in a way that is fair, transparent and effective manner. 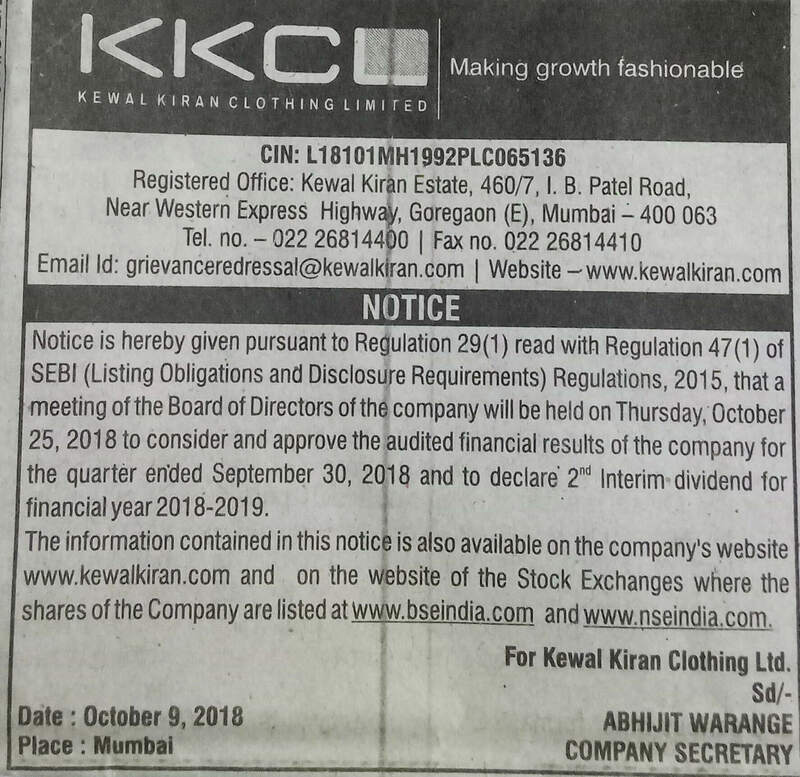 Pursuant to Regulation 30(5) of the SEBI (Listing Obligations and Disclosure Requirements) Regulations, 2015 the following Key Managerial Personnel have been authorized to determine materiality of an event or information and for the purpose of making disclosures to stock exchanges under the said regulation. CRISIL, India’s leading Ratings, Research, Risk and policy Advisory Company has assigned ‘AA- / Stable’ rating for the banking facilities of the company.